Tonight we're bringing back the Big Red: 1/2 oz Irish cream, 1/2 oz Goldschlager® cinnamon schnapps for the shot of the night, even though it's disgusting. 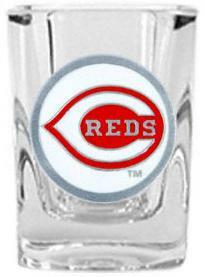 And it's in honor of Joey Votto. I detailed Joey Votto's All Star snub earlier and the kid backed me up today. Votto went 3-4 with 2 homers and 2 RBI to raise his slash line to .318/.418/.599. If you don't believe that he should be the starting first baseman for the NL, we can't be friends. Omar Infante: 0-4, 2 strikeouts. Halladay threw another complete game. His bullpen management is fantastic. Halladay gave up 1 run on 5 hits while striking out 7 and lowering his ERA to 2.33. Oh, he also only threw 93 pitches. I'm not sure he's human.